The Thermocline layer, or Termoclino in Italian, is an invisible blanket of water that separates the turbulent ocean surface from the calm deep water below. When divers pass through the Thermocline layer, the different refractive index of warm and cold water often gives the layer the appearance of wrinkled or frosted glass. 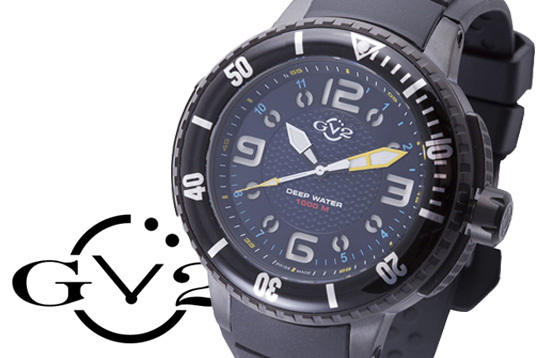 Passing through the Termoclino is something all deep-sea divers experience, and it is a fitting name for the newest professional diver watch from GV2. The GV2 Termoclino is a genuinely impressive timepiece. 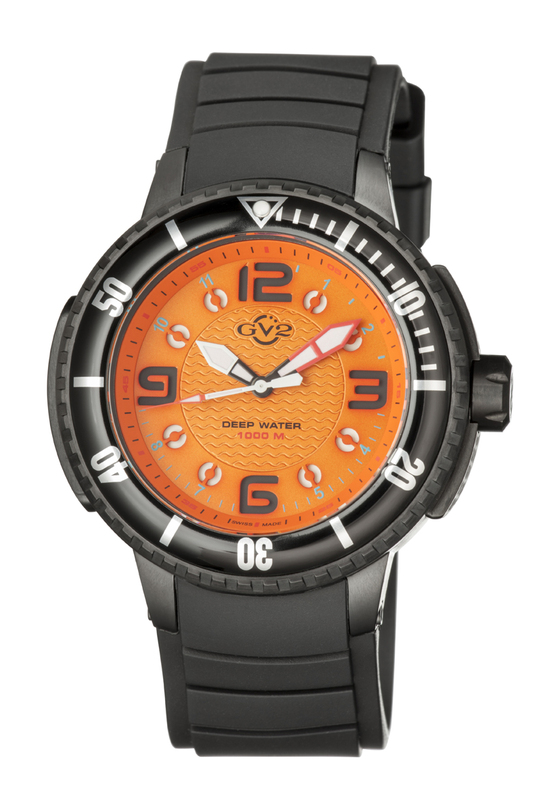 The watch is designed for professional divers and is water resistant to an astounding 1,000 meters. Achieving reliable water resistance at these extreme depths is extremely difficult and GV2 believes it is vital to verify the performance of an instrument that could mean the difference between life and death for deep-sea divers. 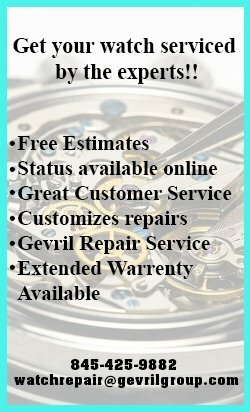 That’s why every Termoclino timepiece that leaves the GV2 factory has a certificate of authenticity that verifies the water resistance and performance of the watch. 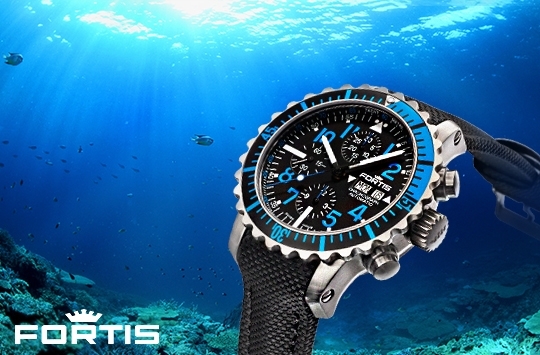 Everything about the Termoclino had been designed with the professional diver in mind. 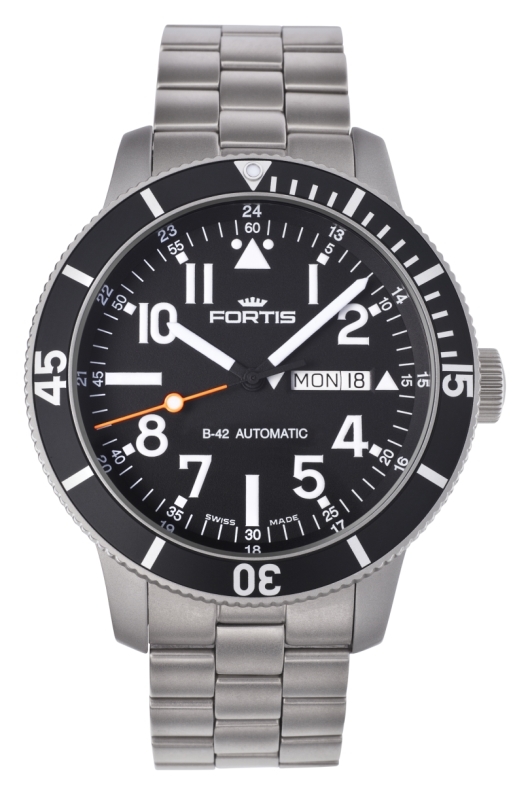 The 48 mm timepiece is equipped with a specially designed pressure resistant 316L stainless steel case that is secured using a professional screw-in case back. 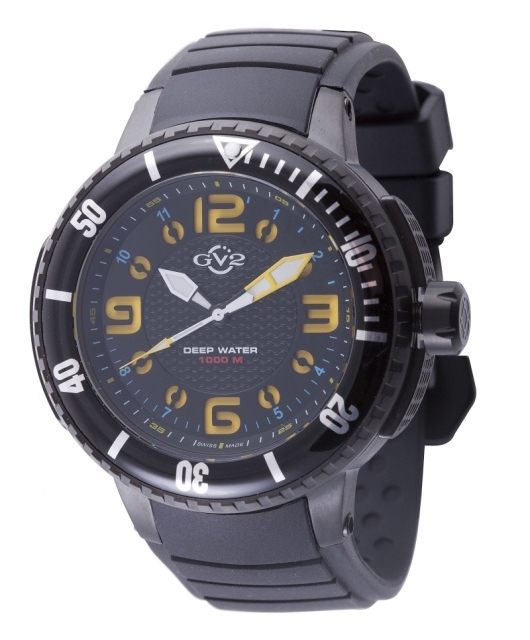 The watch features a large, extremely readable dial that uses a bright Swiss Superluminova coating on the numbers and hands to ensure easy readability under deep-water conditions. 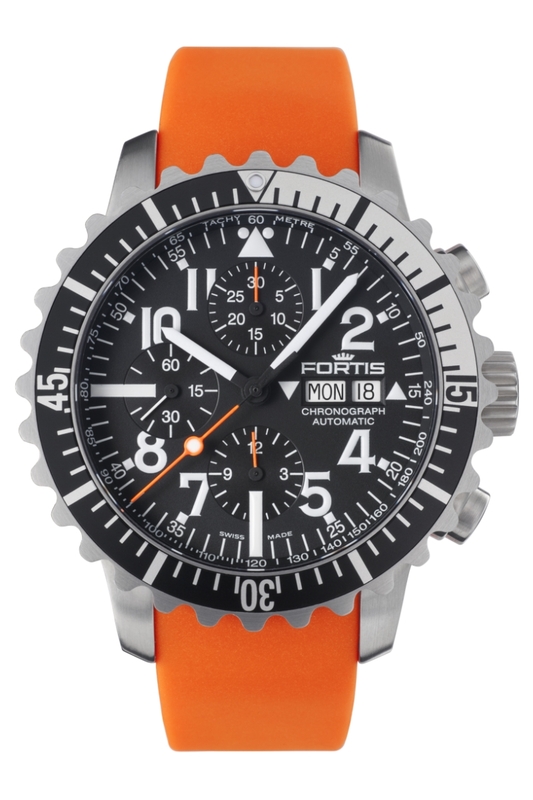 The critical minute hand, used in conjunction with the aluminum unidirectional rotating bezel to calculate remaining dive time, is painted a bright orange for maximum visibility. There is also a professional screw down crown and orange tipped sweep second hand. 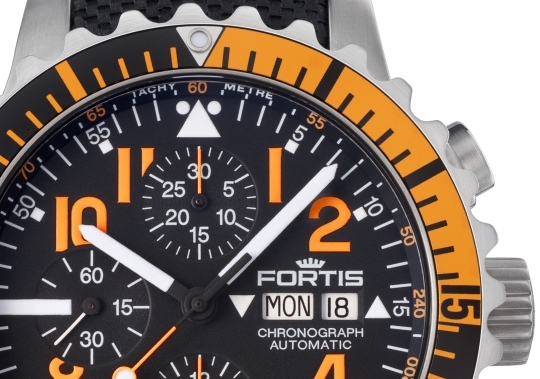 Like many high-end diver timepieces, the Termoclino does not utilize a day or date display that might obscure the diver’s view of critical time information. Each of these limited edition timepieces is individually serialized and features an engraving of the characteristic deep sea diver’s helmet on the back of the watch. 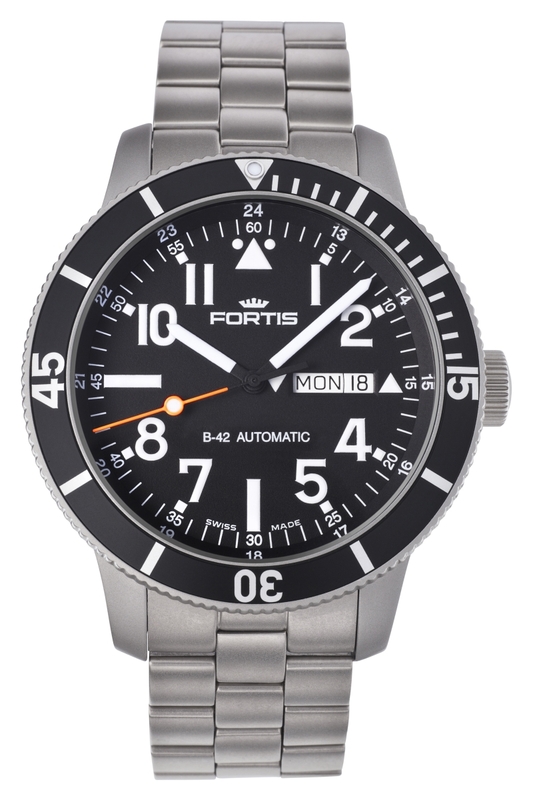 The high performance 316L stainless steel case is paired with a scratch resistant sapphire crystal and a comfortable silicon strap. 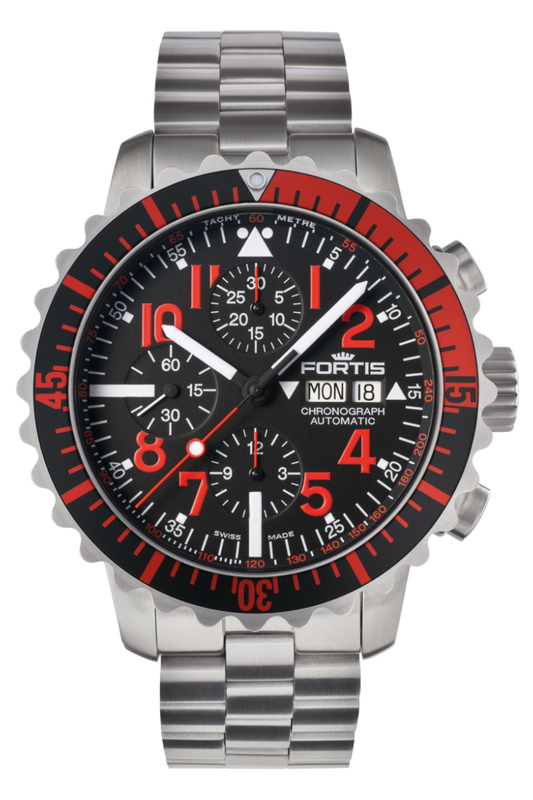 The watch is powered by a precision Swiss made quartz movement for trouble-free operation under all conditions. You don’t have to be a professional diver to appreciate the tools that these pros use. 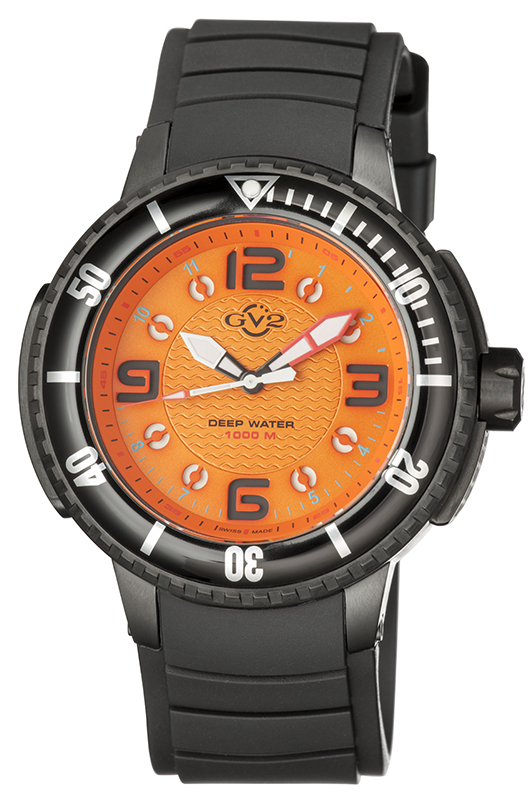 The GV2 Termoclino Diver is the perfect timepiece for any scuba diver or outdoor sportsman. 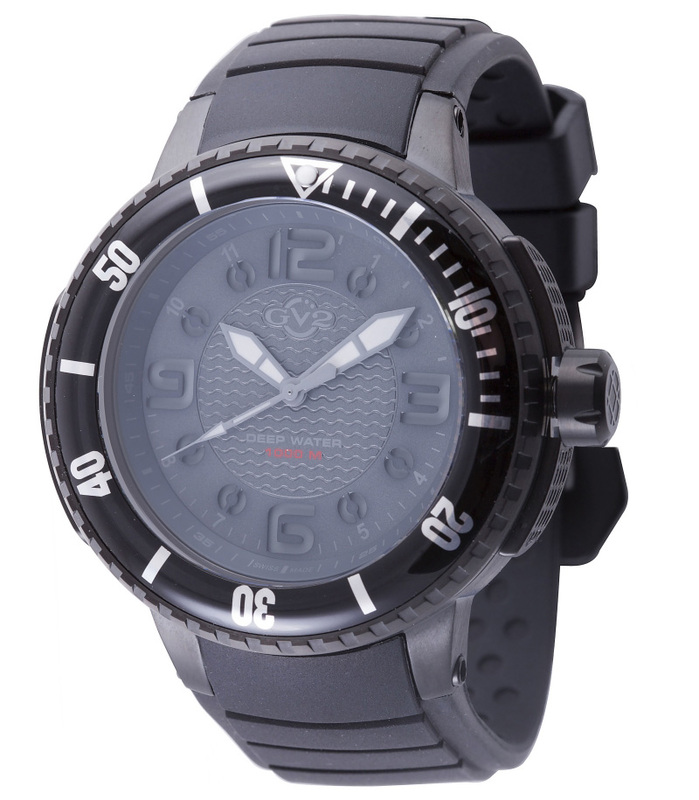 It is also the ultimate sports watch for any occasion. To reserve your own Termoclino diver, contact your authorized GV2 dealer today. 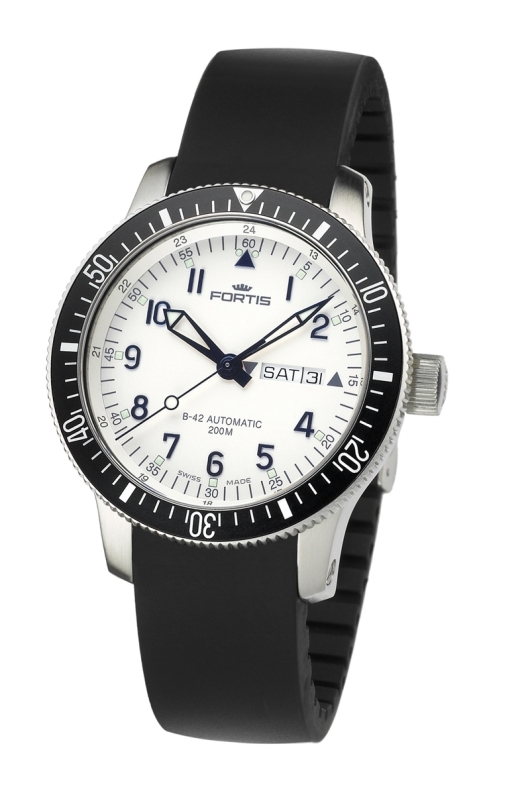 When the sea is unforgiving, you need a watch that has your back. Veteran sailors have known for centuries that the sea can be treacherous and unforgiving. That’s why the best seagoing timepieces have always been uncompromising. When your life could depend on knowing exactly how much oxygen you have left or on setting the correct course for shore, sailors and divers need a timepiece they can depend on under the worst of circumstances. Fortis has become a favorite among seagoing adventurers for precisely these reasons. 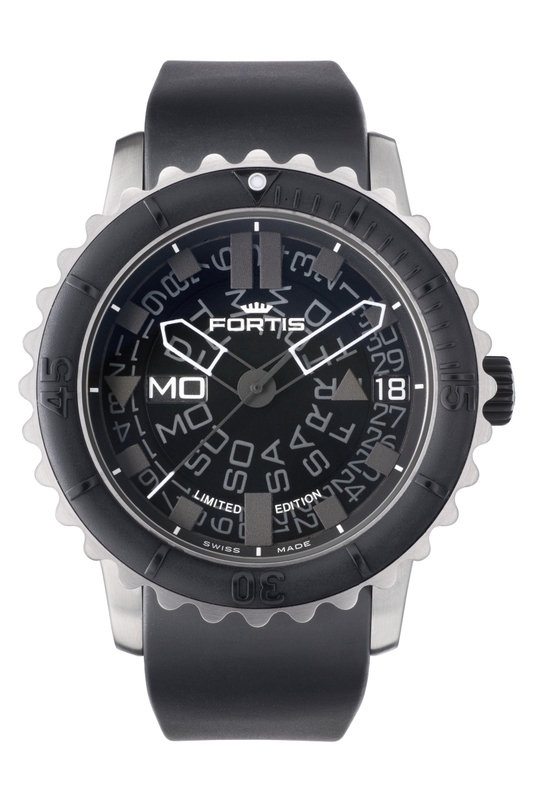 With a Fortis Aquatis timepiece on your wrist, you can be confident that the sea has met its equal. Most Aquatis timepieces feature tough 316L stainless steel cases that are water resistant to an impressive 660 feet. 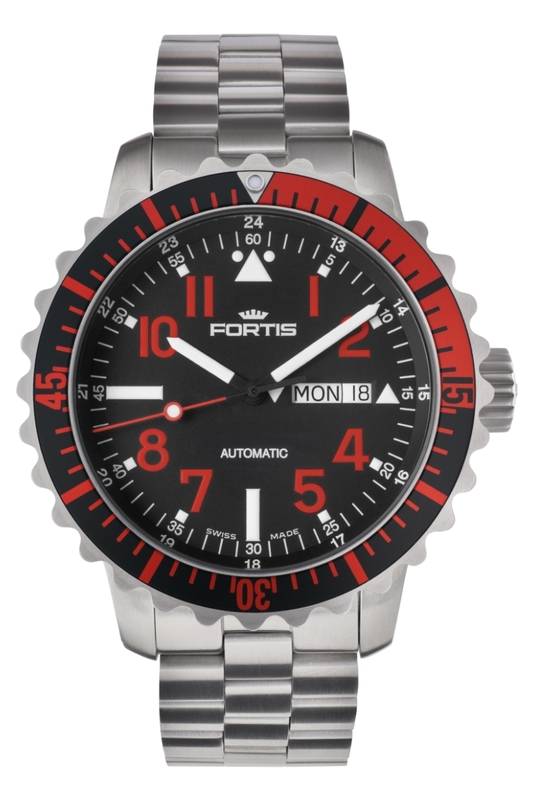 They have screw-down crowns, with clearly marked unidirectional rotating bezels that make it easy for divers to calculate their remaining oxygen supply. These superlative timing tools also feature one of the brightest Superluminova displays available anywhere, making them easy-to-read in even the darkest waters. 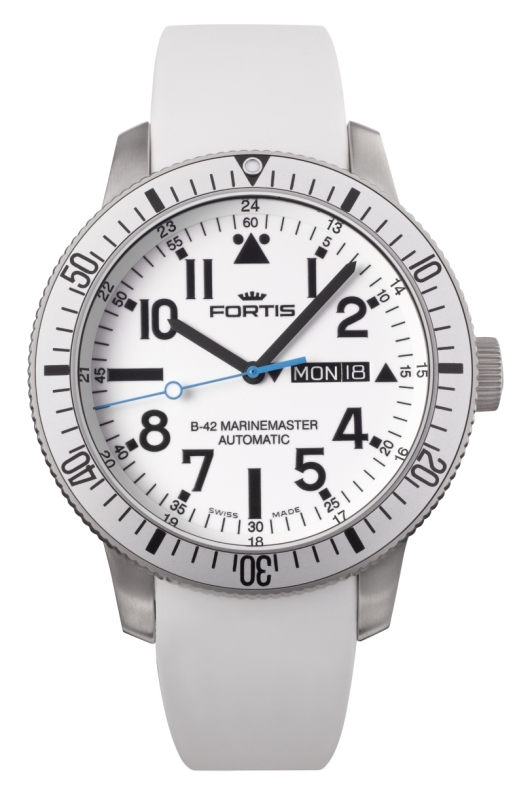 With its clearly superior design and an abundance of functional features, the popular Fortis Marinemaster exemplifies the ideal diver watch. Among the first things you notice about the 42 mm Marinemaster are the oversized lunettes on the unidirectional color-coded stainless steel bezel. These large, knurled lunettes provide an easy-to-grip surface even when using diving gloves, adding an extra level of confidence for the serious diver. 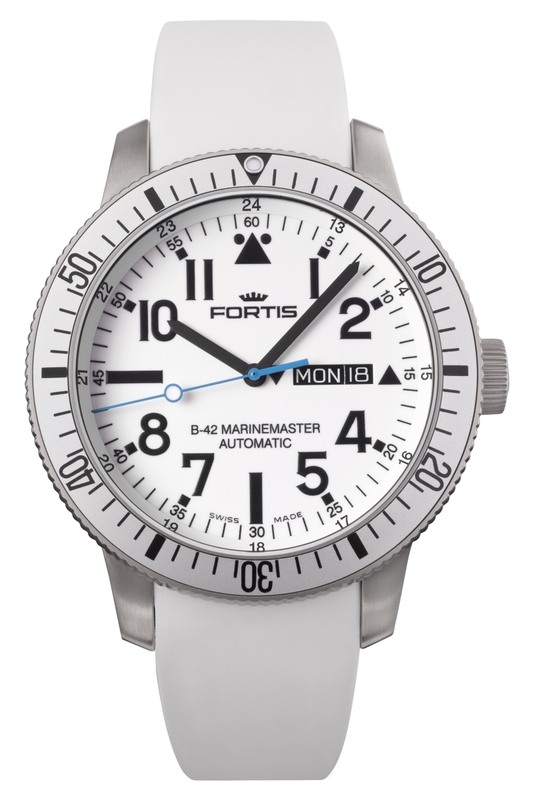 The Marinemaster dial, with its large, uncluttered display and bright white Superluminova numbers and indices is ideal for anyone who spends time on the water. 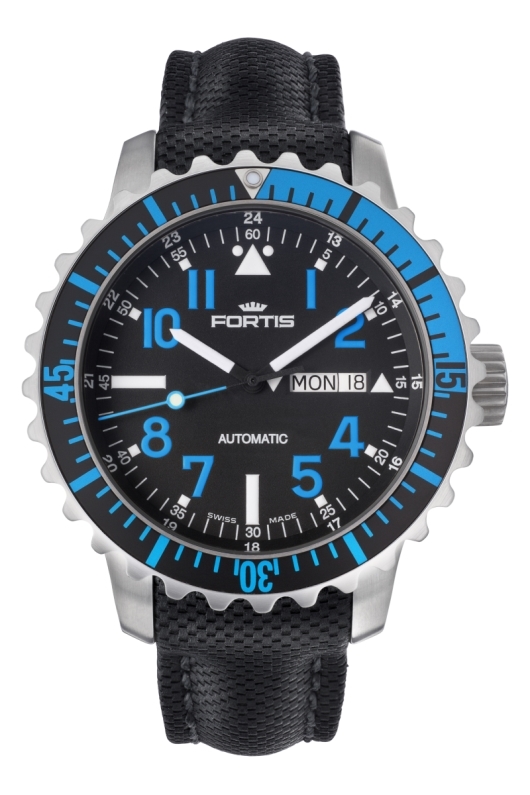 For divers who prefer a more traditional look, the superlative 42 mm Fortis Diver shares many of the Marinemaster’s features, without the oversized lunettes on the rotating bezel. 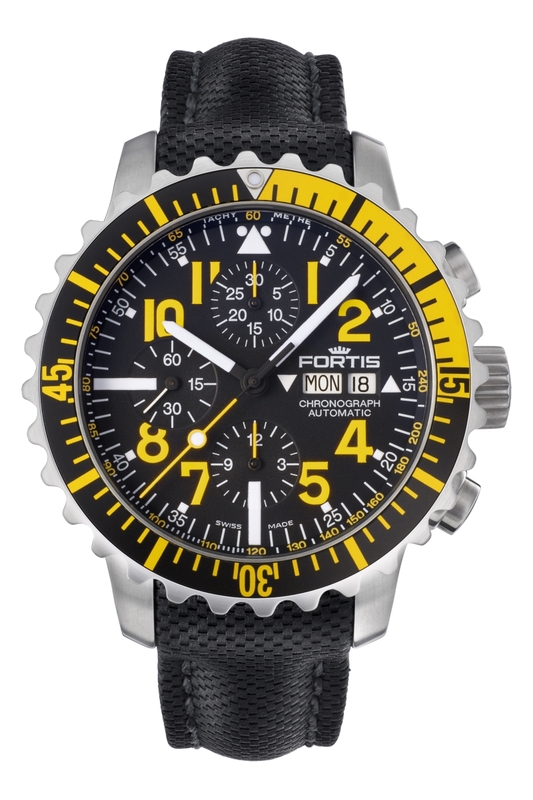 Both models are available in three-hand and chronograph configurations, with a choice of a fitted Fortis stainless steel bracelet, a comfortable silicon strap, or a luxury topstitched leather band. 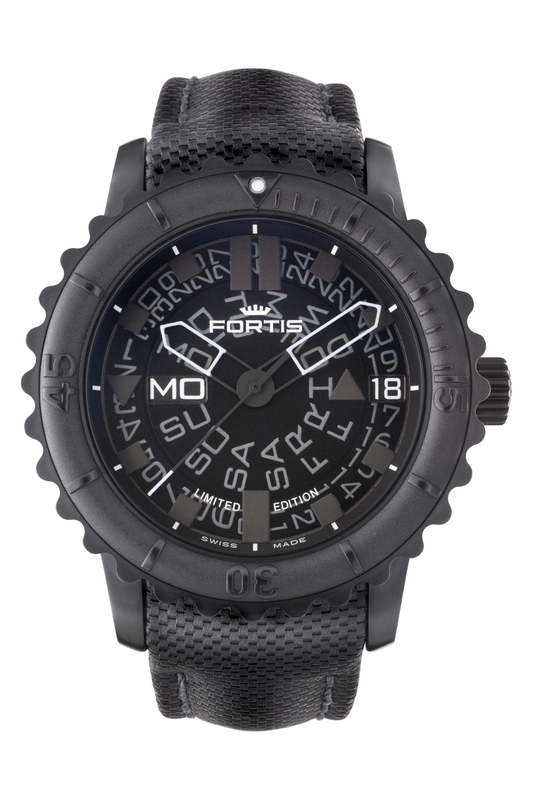 Certain models are also available with a lightweight titanium case and bracelet. Completing the Fortis Aquatis Collection are the unconventional Big models. These oversized 47 mm monsters share the Marinemaster’s unique oversized lunettes, while adding a specially designed unidirectional rubber coated bezel with raised three-dimensional numbers. Unique to the Big is an innovative semi-transparent dial that exposes both the day and date in separate windows, as the two date wheels rotate in opposite directions. At the heart of all Aquatis Collection timepieces is a reliable and extremely accurate Swiss made automatic mechanical movement with a two-year manufacturer’s warranty that seasoned sailors and divers have learned to depend on. If you find yourself spending time on the water, or under it, you’re going to want a Fortis Aquatis timepiece on your wrist. Before you set sail for your next adventure, be sure to contact an authorized Fortis dealer and ask to see the entire Fortis Aquatis Collection. 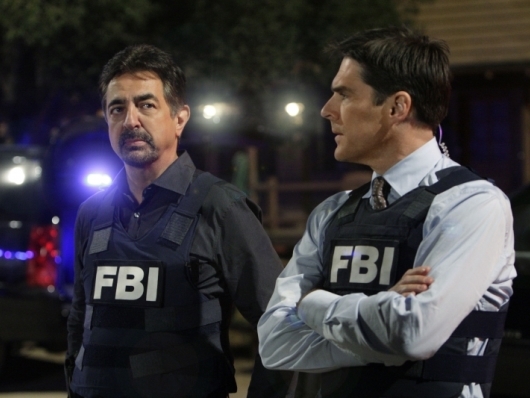 Criminal Minds has been a hit since debuting on CBS in September 2005, and it’s no small part due to the acting talents of Joe Mantegna. 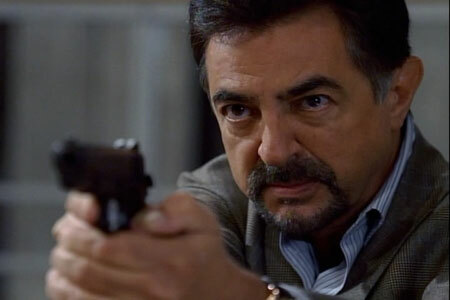 Although Mantegna joined the cast in the show’s third year, after the departure of Mandy Patinkin who played Senior Supervisory Special Agent (SSA) Jason Gideon, he took over the big responsibility of being the headliner responsible for carrying a large part of the show. 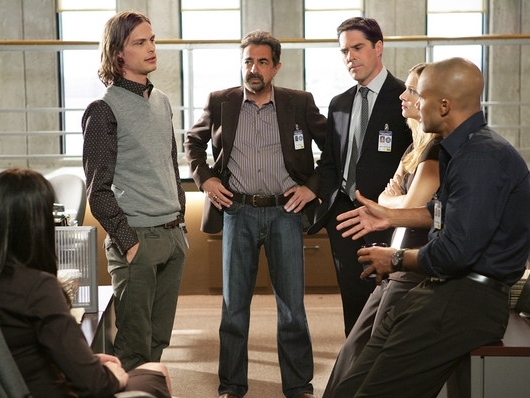 Mantegna plays David Rossi, another Senior Supervisory Special Agent (SSA) voluntarily returning to the team after taking early retirement from the FBI’s Behavioral Analysis Unit (BAU) for personal projects. A highly experienced profiler, he was one of the original members of the unit. During his hiatus he wrote books and did the lecture circuit discussing criminal analysis. 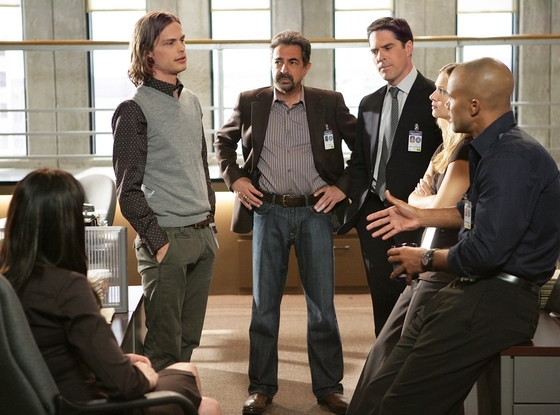 Criminal Minds is what’s classified as a police procedural program. What makes it different is the focus. 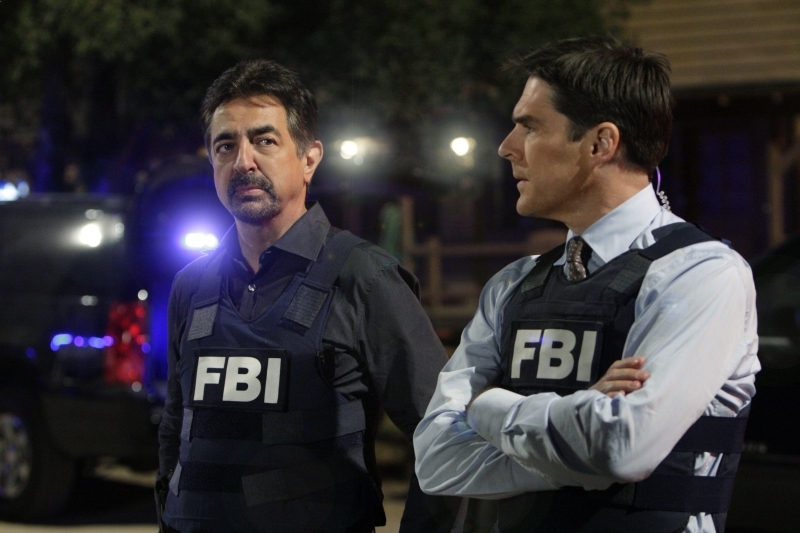 While most, if not all, procedurals focus on solving the crime, Criminal Minds puts their attention to profiling the dangerous criminal referred to as the unsub or “unknown subject”—and these people have really twisted minds. 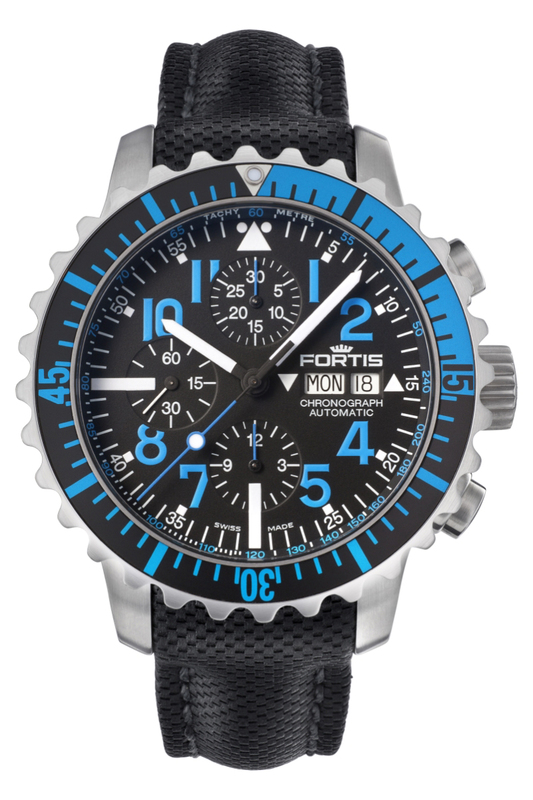 On the show, part of Mantegna’s wardrobe is the Fortis 648.10.12 K, from the B-42 Diver watch collection. 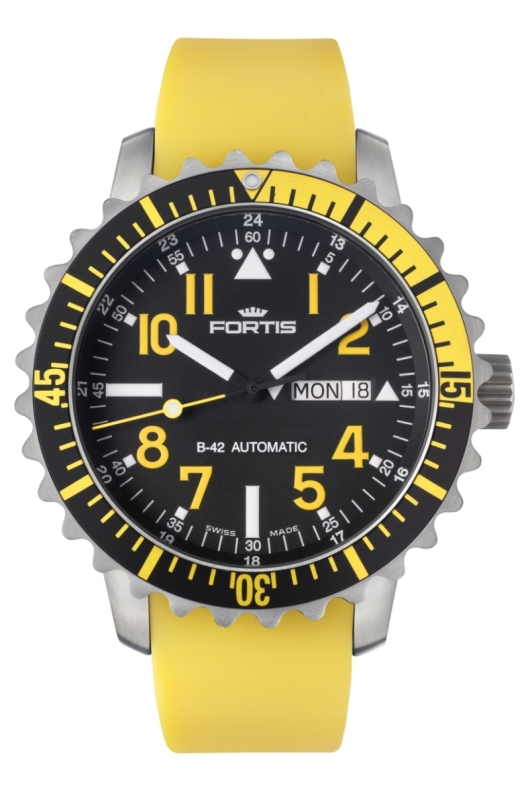 Fortis is known for their rugged watches, and this model has the added benefit of being water resistant, so Rossi can rely on it to hold up in the field, which is crucial in his job. 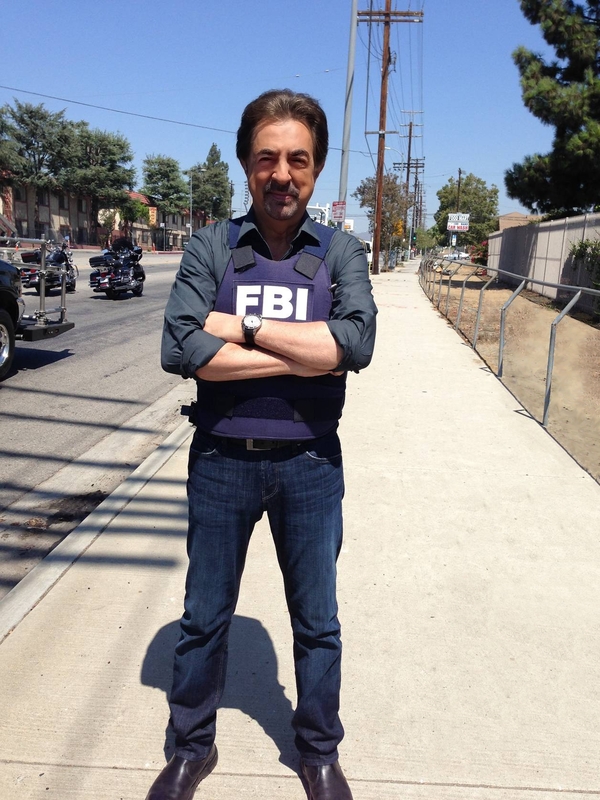 Off the Criminal Minds set, Mantegna is a busy guy with a multi-faceted career. He works in television, film and stage, having appeared in David Mamet’s play Glengarry Glen Ross, for which he won a Tony. He’s acted in films including The Godfather Part III, Bugsy and Searching for Bobby Fischer, and he voiced characters in The Simpsons and Cars 2. But his talent doesn’t stop there, he’s also a musician who played in a band that eventually went on to form the group Chicago. By that time, Mantegna had left the band to pursue his acting career. 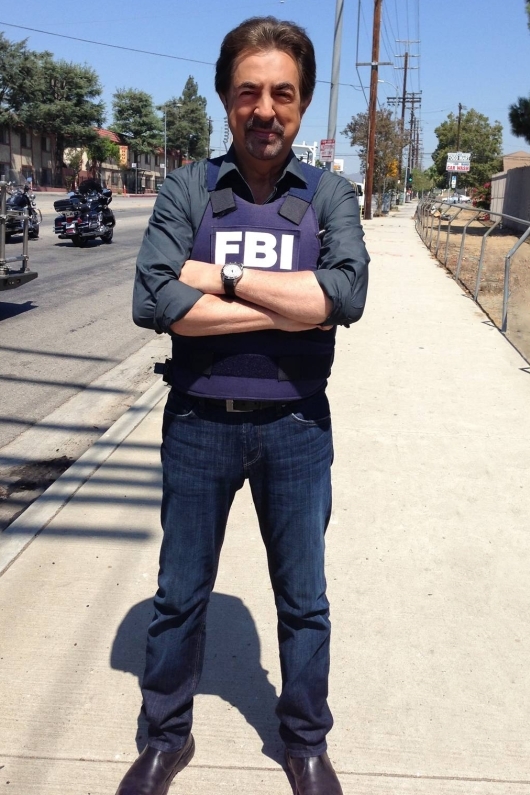 Fans, however, get their biggest dose of Mantegna weekly on Criminal Minds where, when he’s not profiling the bad guys, you can see he’s definitely having a ball with the crew and his co-stars on the set. 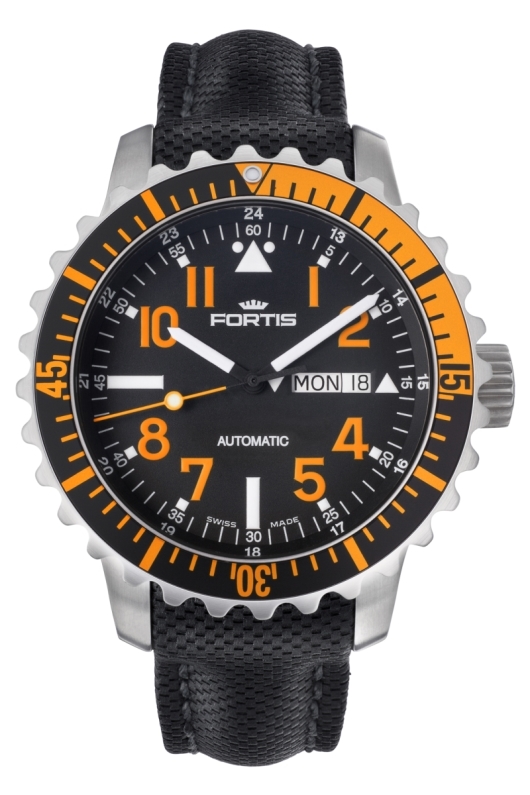 In the following video, Joe Mantegna is wearing his Fortis 635.10.11 L.01 B-42 Pilot Professional watch. “I chose this Fortis watch, because this is what a successful FBI profiler would wear,” Joe says.